Bob Marcucci was recognized by the California Fire Chiefs Association with the first ever annual "Chief Ronny J. Coleman California Fire Chief of the Year" Award along with his good friend Fremont Chief Dan Lydon in 2000. This was especially meaningful to Bob as he is a long-time close friend of Chief Coleman. 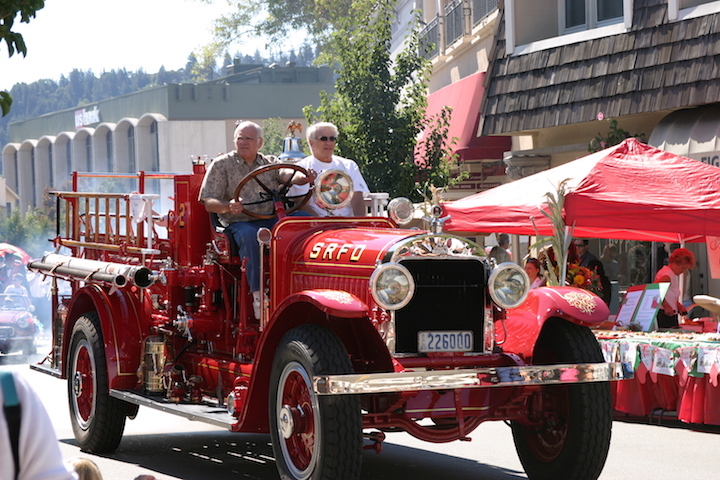 Retired San Rafael Fire Chief Robert Marcucci and his younger brother Marty, retired Ross Valley FPD Battalion Chief, ride on Bob's 1922 Stutz Fire Pumper in the San Anselmo Parade in 2009. Bob and Marty meticulously restored this former San Rafael fire engine after rescuing it from a collector in Morgan Hill - look forward to the full story soon. See our Historical Fire Apparatus section for at the full story and video on the Stutz. Photo courtesy of Tom Forster.